Cheese slicers are the answer to every cheese lover’s prayer. Though archaic cheese slicers have been around for some time, their design always left more to be desired. But the new and improved cheese slicers available today will let you cut the hardest of cheese in the thinnest of slices in a single swift cut. Here we have reviewed some of the best cheese slicers in the market and included a shopping guide to help you choose the one that suits your needs. Getting your hands on the best cheese slicer can become a tedious task if you don’t know what you’re looking for and where you should look for it. While your local market seems like a good place to start, they might not house as great a variety of products as you can find online. Online shopping for cheese slicers presents its own set of problems; you can’t see the actual product and the reviews you read might be biased. But don’t worry, we have you covered. We will not just walk you through the process of selecting the best cheese slicer, but also give you a list of products we have used and loved. The type of cheese you want to cut; if you are looking to cut hard cheese, a blade cheese slicer would be better than a wire one because wire has more chance of breaking under pressure. The kind of slices/cut you want; usually wire slicers help you cut thinner slices than blades do. The amount of cheese you want to cut at one time; domestic cheese slicers usually don’t cut through very thick blocks of cheese. Other factors to consider are the frequency of use (wire slicers need to be replaced more often than blade ones), the ease of cleaning (blade slicers are more difficult to clean than wire ones), and the price range and durability. A cheese knife is much like a regular kitchen knife, only sharper. Some cheese knives have extended blades, protruding in a V shape at the end, so as to help picking the cheese slices up easily. 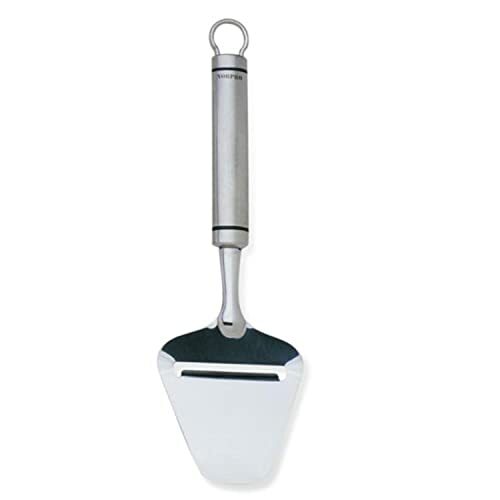 A cheese slicing spatula is designed like a cake serving knife, only with a sharp slanted blade in the center. The spatula can be run over the cheese to cut a thin slice. A cheese plane uses an aluminum or steel wire usually attached to a static board to cut cheese. The cheese is placed on the board and the wire is brought down to slice it. You can choose the thickness and size of the slice when using this type of cheese slicer. A cheese cutter has a similar design to the cheese cutting﻿﻿ spatula but it uses a wire instead of a blade to slice the cheese. The wire is usually accompanied by a small rolling pin to adjust the thickness of the slice. A Girolle is a rotating blade cutter attached to a stationary base which is usually made from wood. The wooden base has a nail in its center that holds the cheese while the blade rotates and slices it. This is usually used for hard cheeses only. Here are some other types of cheese slicers you may find useful along with some bonus tips about cheese. If you are looking to buy a cheese slicer that uses wire, make sure the model either comes with some spare wire or allows you to change the wire once the original one gets damaged. When buying blade cheese slicers make sure that the blade is made of either aluminum or stainless steel so that it doesn’t rust or chip. Make sure you read the washing instructions of the cheese slicer before buying it. Most cheese planes aren’t dishwasher safe and have to be washed by hand. Look for slicers that either don’t have to be assembled at home, or have very little assembly required. Products that come assembled are more convenient to use. Also read about how to slice cheese blocks effectively. The Good Grips Wire Cheese Slicer is one of the best handheld cheese slicers on the market. 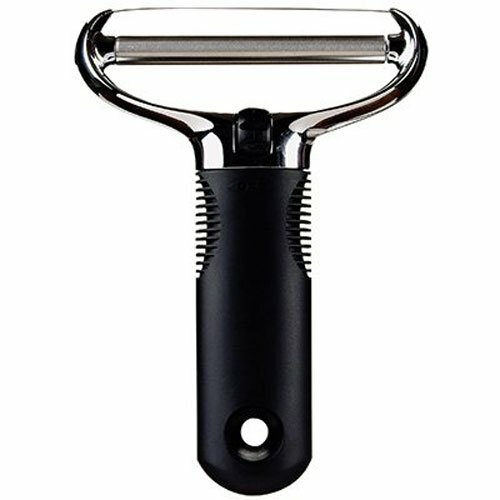 For one its rubberized handle is easy to grip and maneuver, for another it is one of the widest handheld cheese cutters out there making it an instant favorite for cutting large blocks of cheese. The slicer uses sharp wires to cut through cheese and you are given the freedom to adjust the wires as you please. As with all handheld cheese cutters you can adjust the angle of your hand and﻿﻿﻿ cut cheese slices in the thickness you desire. While hard cheese or thicker blocks may require you to put in a little more effort, this slicer works splendidly with soft cheese and thinner blocks. Another thing to keep in mind is that, at the wrong angle, this slicer may break and pick up some bits of cheese around the corners of the blade. To remedy this, try to cut smaller slices and keep cleaning any residue left in the corners as you go. Although the label says it's dishwasher safe, we would recommend washing this by hand as the wire is susceptible to breaking in the dishwasher. The Norpro Stainless Steel Cheese Slicer ranks among the most sought after handheld cheese slicers in the market and with good cause; the slicer is easy to use and lets you cut really thin slices. The slicer can be held and moved comfortably and it's spatula-like head makes sure the cheese slice retains its shape. The stainless steel body makes this slicer sturdy and heavy. 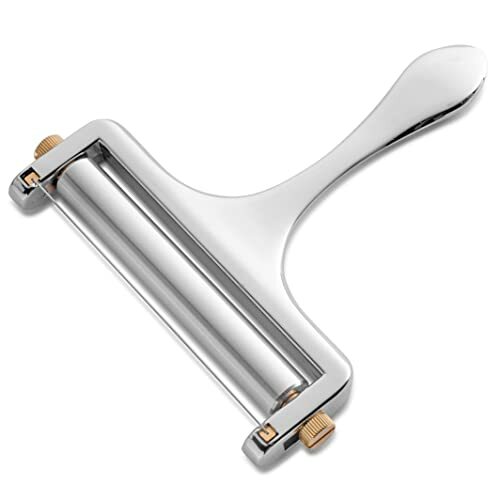 The slick finish makes it easy to wipe off any cheese residue and helps the slicer glide on the cheese. As far as washing this is concerned we would recommend that you wash this by hand because a dishwasher won’t be able to clean the angled blade well and some residue may be left in the corners. The Fox Run Marble Cheese Slicer is one of the prettiest cheese slicers on the market. It is a cheese slicer that is functional yet fashionable. This slicer falls under the cheese plane category and has a wire cutter attached to a white marble base. The marble base is a dream for washing as you can just wipe it clean with a wet cloth. The smooth base also allows you to easily glide the cheese block along as you slice it. The wire is taut which makes for quick clean slices. Like most plane slicers, this is not dishwasher safe, but the marble base is fairly easy to clean as opposed to wooden bases that take more effort and time. As the name suggests the Bellemain Adjustable Thickness Cheese Slicer allows you the freedom to choose the thickness of cheese slices. This is probably the only handheld cheese slicer that has this feature and it makes this slicer a must-have. The slicer is made entirely of stainless steel making it both sturdy and durable. The handle is easy to grip and just the right length. The wire is strong, sharp and slices easily, smoothly. The sleek finish of the slicer makes it a stylish addition to your kitchen and is easy to clean. The best thing about this slicer is that it slices both hard and soft cheese. 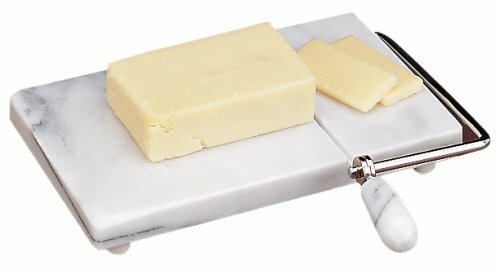 Its ‘one-size fits all’ approach makes it perfect for slicing any kind or size of cheese, though you might have to look for the perfect angle for slicing large blocks. We saved the best for last with the Prodyne BB-120 Block Cheese Slicer. 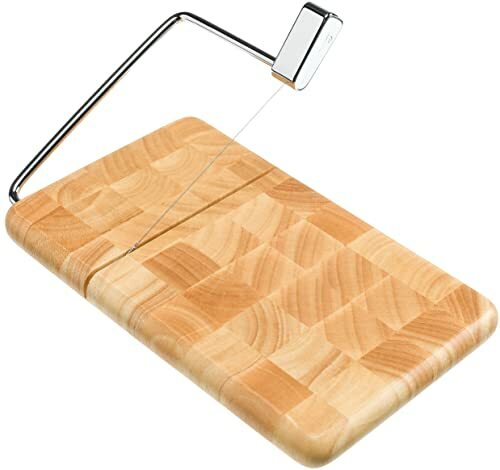 This cheese plane slicer combines a sturdy stainless steel wire with a beautiful end grain Beechwood base. The slicer is amazing to look at and amongst the best in function as well. The BB-120 slicer is a dream to use since it can cut both hard and soft cheese. In fact, a lot of people use this to cut soaps as well. The wire alignment needs to be adjusted but that’s a minor glitch for a product that offers so much function at a reasonable price. Another winning aspect of this slicer is that it is very hygienic; the wooden base keeps the cheese cool and fresh and the smooth finish allows you to wipe off any extra slime with a wet cloth. This slicer isn’t dishwasher friendly, but cleaning it isn’t a lot of hassle. Just make sure that you don’t let this soak for too long as the wood absorbs the water and will take a longer time to dry. Having tried and tested many cheese slicers in the market, we can safely say that the one that impressed us most is definitely the Prodyne BB-120 End Grain Beech wood Butcher Block Cheese Slicer. We think this slicer is a clear winner because it gives you the most value for the cost. It is easy to use and comes fully assembled. Another winning aspect of this slicer is that it comes in five unique designs so you can choose the one that pleases you the most. If you want a cheese slicer that cuts all kinds of cheese effectively and is durable look no further.